Join us for the opening session of the 3rd Annual Gender & Equity Research Symposium, Practicing the Equity We Preach, with opening speakers Anna Christopher and Marc Grimmett who will set the tone for the day. Pre-registration required. Facilitated by Kasey Ashton. Panelists include Dr. Karey Harwood, Dr. Joy Little, Dr. Jamilia Simpson. Readings will be sent in advance if you register here. It is not always clear as to how to incorporate good social justice practices within research practices in the field. IRB helps researchers navigate social justice and issues of equity throughout the research process. We do this through a focus on research ethics and regulatory compliance. This makes it so all research plans that involve humans are developed with the treatment of those humans in mind – specifically with a lens of autonomy, respect, justice, care, and equity. Come chat with us! Two sessions at 11:30 & 1:30. Closed session. Only for students who have submitted to be a part of the student roundtables. Open to the public oral presentations. More information forthcoming regarding speakers. Come learn about the WomensNC Scholars program and engage in the research of this year’s scholars who visited the UN and carried out research around gender and equity. Join us for our closing dessert mixer. The mixer will have opportunities to engage with departments/colleges/units across campus engaged in Gender & Equity work as well as offer an opportunity to learn more about equity research. Womxn of color have varied experiences when studying, working, living and traveling abroad. Many of these experiences are often left out of the mainstream narrative, which underscores how travel enhances white womxn’s perceptions of the world. By contrast, this interactive panel discussion will provide a platform for those who identity as Womxn of Color to share their experiences and discuss how being abroad has impacted their perspectives on equity in relation to race, class, gender, sexuality, citizenship, and accessibility for all bodies. Speakers and panelists include Dr. Blair Kelley, Kory Saunders, Dr. Sachelle Ford, Claudia Rodriguez, Asia King, Hannah Rainey, and Haddy Njie. The following are oral presenters for the Gender & Equity Research Symposium. Each speaker will have 10 minutes to orate their research and facilitate question and answer. Join us to engage in their scholarship! Hosted by the NC State University Women’s Center with support from our campus partners in The Study Abroad Office, NCSU Libraries, Women and Gender Studies, The African American Cultural Center, The Women of Welch Living and Learning Village, and the Department of Biological Sciences. Angela Gay (NC State Women’s Center), Elizabeth Nelson (Women and Gender Studies), Hannah Rainey (NCSU Libraries), Alexa Carter (NCSU Libraries), Kory Saunders (Study Abroad), Sachelle Ford (The African American Cultural Center), Bri Elum (Women of Welch Living and Learning Village), Karey Harwood (Women and Gender Studies), Melissa Ramirez (Department of Biological Sciences). If you are attending the Gender & Equity Research Symposium from off campus you will need to pay for parking. 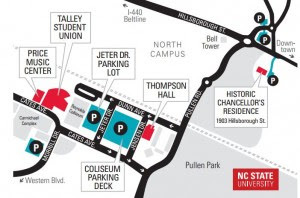 Visitors to Talley Student Union may park in the hourly pay lot on the lower level of the Coliseum Parking Deck. The lot entrance is on Dunn Avenue across from the bus stop. Please see below for a campus parking map. In compliance with the Americans with Disabilities Act, NC State will honor requests for reasonable accommodations made by individuals with disabilities. Requests can be served more effectively if notice is provided at least 10 days before the event. For more information, please contact Angela Gay at 919.513.0929.